There are many books on watercolour out there and somehow Joe Cartwright still managed to bring something different with his twenty years of painting experience. First of all, his paintings are beautiful. It reminds me Joseph Zbukic's style of colours blending and light rendering. Some interesting things you'll learn in the book will be on how you can use a spray bottle to keep your paintings wet and workable for a longer period of time. There are three techniques taught on how you can draw clouds depending on which style you fancy. The tutorials are insightful and in-depth. Many of them covers the wet on wet techniques that enables you to create wonderful colour transitions whether in the landscapes or street scenes. One thing I like is Joe also teaches how to paint the effect of reflected light. By reflected light, I mean that beautiful gradated bright road under the hot sun, or the sun reflecting on a wet surface after a rain. There are other things like little tips and techniques to watercolour that are useful. My watercolour style is more on using flat well mixed colours but lately I'm moving towards gradated colours and transitions and this book is a great help. 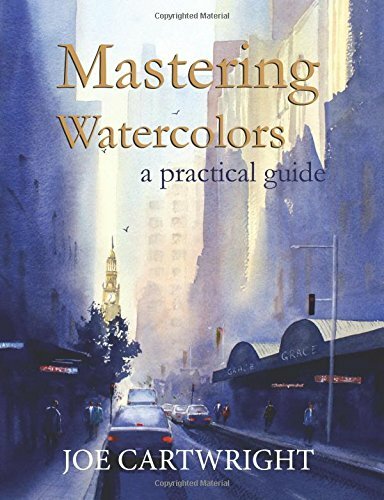 It's a great instructional book for watercolour artists. You can't have too many good books.